Danger Lurking in Plain Sight. The Interior Designer Did It! Imagine, if you will, a tea party. Not a Boston Tea Party, or a political Tea Party, but a good old-fashioned, civilized tea party. It is a meeting of friends and unstated enemies over tea, crumpets, and jam. The scene is a stately manor in the hills of Northumberland. In attendance are all the ladies of high society, dressed in their Sunday best despite it being Wednesday. Yes, this is a party of the landed gentry, a place to gossip, a place judge, and a place to stab one another in the back. The room is immaculate and the walls are covered with lustrous green wallpaper and gilded gold trim. Servants wait in attendance to answer the ladies’ every need, overseen by their leader, the butler. He stands along the green wall like a statue, observing but not listening to the scandals of the day. Unfortunately, the butler does not have many days left to observe, because he is being poisoned. And he will die a very unpleasant death soon enough. The local doctor will rule the cause of death as an unusually bad case of gastroenteritis. As I said, an unpleasant death. And so the question we must all ask is, who killed the butler? Did he hear something he wasn’t supposed to hear? Were there upstairs/downstairs issues at play? Or was there perhaps something amiss with his staff? Later analysis will reveal that the butler did not have a contagious gastroenteritis but instead was the victim of a long-term poisoning by arsenic. Neither the ladies of the room nor the house staff will be implicated, except perhaps for the interior designer, because it turns out that the butler was poisoned by the green wallpaper that rubbed against his clothes hour after hour, day after day. How on earth could the wallpaper be the culprit, you ask? Because the dye used to color that wallpaper green was infused with arsenic. This may sound more fantastical than the notion that one of the guests poisoned the butler, but this was a real scenario. Green wallpaper in the 19th century was, in fact, largely made with arsenic. The off-gassing of that arsenic literally and actually killed people. 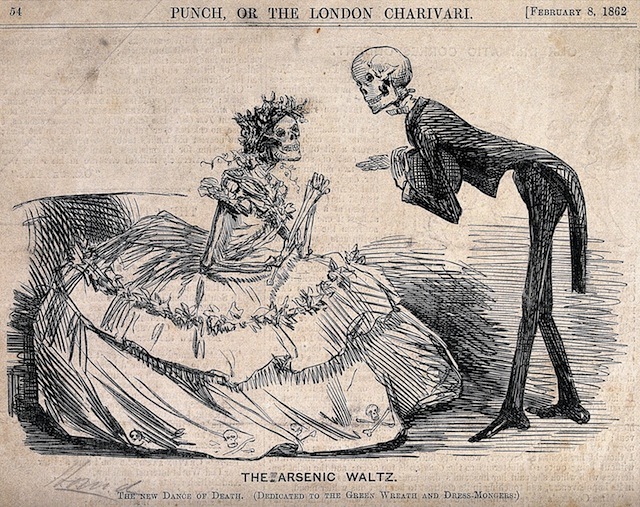 And it was not just green wallpaper that arsenically poisoned people in the 19th century, as the heavy metal was used in a wide variety of everyday products. Products such as fabric, makeup, cardboard boxes, candles, oil paint, venetian blinds, soap, etc etc etc (a list from the Poisoner’s Handbook, by Deborah Bloom!) all contained arsenic. The history of business is littered with quotes just like this, from executives and others with a financial stake in something secretly dangerous. And statements like this surely have contributed to countless deaths and other maladies. We have always been surrounded by things that will do us ill, things that we would surely do without if we only knew of the dangers that lurk within. Torts, and products liability law in particular, can play a pivotal role in exposing the true nature of that which we think of as safe. Perhaps the best-known example of this is asbestos. Asbestos is an unusual product, a fibrous mineral that was widely used as a flame retardant, insulator, and other building material for a very long time. If you’ve watched television in the middle of a weekday, you’ve probably heard ads from questionable law firms pointing out that asbestos exposure causes mesothelioma, a very unpleasant and deadly cancer. And just like with arsenical wallpaper, asbestos producers proclaimed that any evidence that their product was dangerous was flawed. I actually once had the good fortune of visiting the town Asbestos, Quebec, home of one of the world’s largest asbestos mines. It was a bizarre place where it felt almost like the inhabitants had never heard about the asbestos/cancer link. The town was so out of sync, in fact, that Comedy Central’s the Daily Show once did a segment interviewing/mocking the mayor as he tried to defend the town’s namesake product. It turns out that despite being largely banned in Canada, the town’s mine was exporting asbestos to other countries, like India, that still allow the use of asbestos in building projects. Thankfully a shift in power between political parties in 2012 caused the Quebec government to cancel a $58 million loan to revive the asbestos industry and instead pledged to help the mining community diversify its economy. It is amazing that, despite our now-longstanding knowledge that asbestos is deadly, the mine in Quebec only closed in the last few years. Both the asbestos and arsenical wallpaper examples make me seriously question what products that are common in our 2017 lives will someday be revealed to be horribly dangerous. It is inevitable, isn’t it? Every once in awhile we hear unverifiable concerns about the dangers of cell phones, but I suspect the toxin of our lives will be something we never saw coming. Maybe it’s in the water we drink, or the bottles we drink it from. Maybe it’s in our mass-produced clothing, or in an additive in all of our toothpaste. The likelihood is that there are almost certainly MANY things that we see as safe that are in fact dangerous. And just like arsenical wallpaper and asbestos, the manufacturers and distributors of those goods will likely have advanced warning about the threats they are peddling. But the threats to their bottom line will likely keep it under wraps until some bold plaintiff will bring a tort suit and unravel the whole thing.